A tranquil alpine retreat awaits at this one-of-a-kind property! 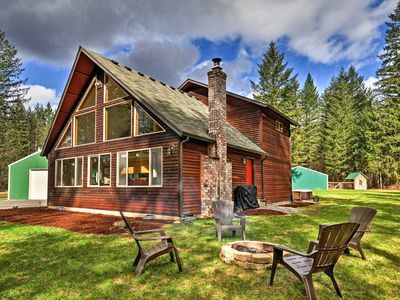 With direct access via walking trail to the scenic waters of Yale Lake and easy access to the snow-capped peaks of Mount St. Helen, let 'Zeke's Lake Lodge' vacation rental host your next getaway to the charming town of Ariel, Washington. 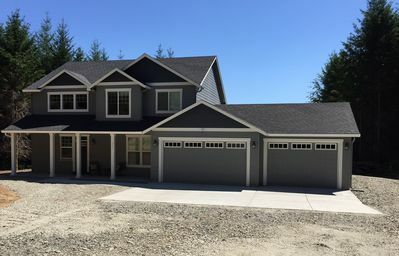 With 3-bedrooms, 2.5-bathrooms and a loft, this inviting house accommodates 10 guests and is sure to blow you away! The moment you arrive you'll fall in love with this home's peaceful location. Nestled between towering trees, a lush green meadow of 5 acres, 'Zeke's Lake Lodge' creates a picturesque backdrop for your stay. Boasting vaulted ceilings, beautiful hardwood floors, grandiose windows, and an array of modern amenities flowing throughout the open floor plan, this spectacular home provides you with plenty of comfort and privacy to spread out and relax. Prepare mouthwatering, fresh seafood in the spacious kitchen, fully equipped with granite countertops, stainless steel appliances, and a breakfast bar. No need to pack your entire wardrobe, as this cabin offers an in-unit washer and dryer for your convenience. Additional amenities include central air conditioning, 4 Smart TVs with DirecTV, Bose Bluetooth speakers and over 150 channels, Xbox One, a DVD player, and wireless internet access - sure to keep you comfortable and entertained. After an exhilarating day of lake activities at nearby Yale Lake, sink into the private hot tub to relax. After this, escape to the luxurious master bedroom suite, complete with a king-sized bed, dual head shower, and a jetted Jacuzzi tub, or one of the other 2 lovely bedrooms to prepare for the next day's festivities. 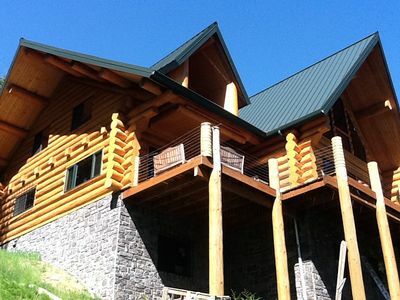 From this incredible location, you'll have easy access to a multitude of exciting attractions, most notably, Yale Lake, which is accessible via walking trail winding through a Rocky Mountain Elk Reserve. Spend your days boating, kayaking, and swimming at Yale Reservoir at Saddle Dam, and the boat ramps at Lake Merwin located in Cresp Bay. Test your fly fishing skills on Merrill Lake and Lewis River, or hit the links at the Lewis River Golf Course. Climb the stratovolcano of Mount St. Helens or explore the scenic footbridges of Lava Canyon and Windy Ridge. 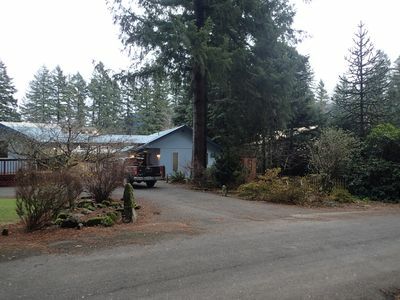 When you're ready to check out some more local attractions, head into the town of Battle Ground, only 40 minutes away. In Battle Ground you’ll discover delectable eateries, local pubs, and alluring shopping. Additionally, the quaint town of Cougar is located nearby, where you'll find a great pizza place, some small stores, and Cougar Bar and Grill - home of the famous Ape Cave Sandwich. Mt. St. Helens Ape Caves are also a short distance away, ensuring a memorable experience and stunning sights. 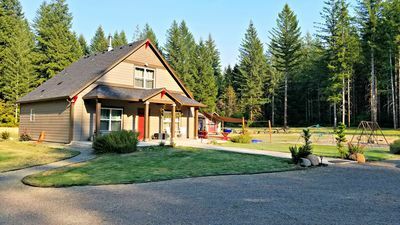 However you choose to spend your time at this peaceful Ariel vacation rental cabin, situated near the water's edge of Yale Lake, you are sure to leave feeling relaxed and refreshed. 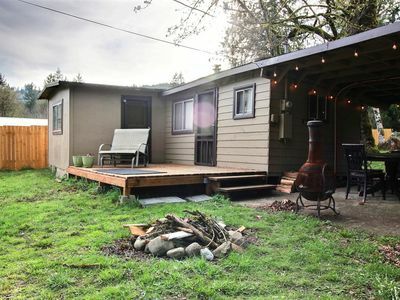 - Wood is provided for both the wood-burning stove and fire pit! 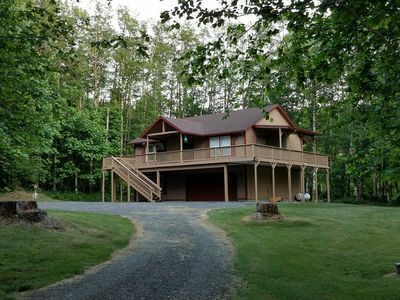 Lakewood Retreat: Peaceful, Relaxing, Secluded, With Hiking, Lakes, and Hot Tub! A beautiful and peaceful retreat! Boating, swimming, hiking all just steps away! Jennie's Lake Cottage on 5 acres in the woods next to Yale Lake.